The old-fashioned name for this dessert is dump cake. In the interests of expediency, you dump the dry ingredients into the baking pan and stir them. You then add the oil, vinegar, and vanilla, give it a stir, and pour a cup of cold water over. A few whisks to combine, and the pan goes in the oven. No fuss, very little muss, and 40 minutes later you have a cake. I tend to be particular about blending, so I whisked the wet ingredients together in a large measuring cup, then stirred them into the dry ingredients in the pan. This is not, as I’ve said, necessary. Greasing and flouring the pan is also unnecessary, since the pan is also the mixing bowl. The result is a chocolate cake that’s moist without being dense, and not overly sweet. For those with dietary issues, cake is eggless, and if you don’t use milk chocolate chips, dairy-free. The chocolate chips and walnuts weren’t part of the original recipe, in fact. You may omit them, or switch it up: add pecans or hazelnuts instead of walnuts, white chocolate or even butterscotch chips if that’s your thing. I’m thinking a handful of coconut and some pecans might be a tasty combo. Frosting is another possibility, if you’re so inclined. I tend to like the cake as is, but I have been known to sneak in a scoop of ice cream on the side. 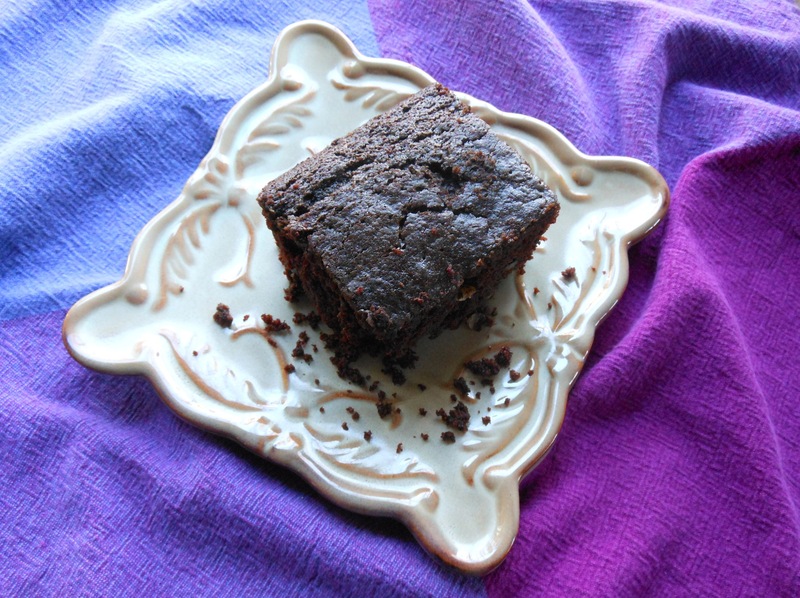 Really, this cake’s biggest asset is that in the time it takes to make a boxed brownie mix (not that there’s anything wrong with that), using ingredients you probably always have in the pantry, you have a made-from-scratch, dark, luscious cake. Enjoy! This just in: I was just interviewed by Food Blog Radio. Gary House, a food blogger himself, created and hosts FBR, which runs profiles of food bloggers (podcasts and YouTube videos) about once a week. Look for the Rivertree Kitchen interview in about a month (I’ll post a link), and many thanks to Gary for creating such a great resource. Heat the oven to 350 degrees F. Pour flour, sugar, baking soda, cocoa powder, and salt into a 9-inch pan. Stir until well combined. In a large bowl or measuring cup, preferably with a spout, whisk together the oil, vinegar, vanilla, and water until well mixed. Pour into the dry ingredients in the pan. (You may also simply dump the wet ingredients into the dry right into the pan, if you prefer.) Stir just until combined. Stir in chocolate chips and walnuts. Bake for 40 to 45 minutes until a toothpick inserted in the center comes out clean. This entry was posted in baked goods, sweet stuff and tagged cake, chocolate, dairy-free, dessert, easy, egg-free, sweet. Bookmark the permalink. Oh honey, this looks and sounds scrumptious.